Udita Seksaria Golchha comes off as someone with a great sense of style. She stands tall, exudes elegance from the way she carries herself and is involved in many ventures, two of which are PARTIES.R.USS and Happy Mamas. Besides her many ventures, she has also been organizing Beyond The Hanger, a pop up shop that takes place at various locations around Kathmandu. She talks to Svasti Garg and reveals a few of her favorites. 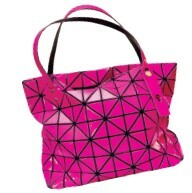 This bright pink BAO BAO by Issey Miyake is one of my favorites, which I purchased in Singapore three years ago. It immediately caught my eye because of the vibrant color and unique design. The best part is that it’s waterproof! I am someone who loves flats. I can wear flats for every occasion. 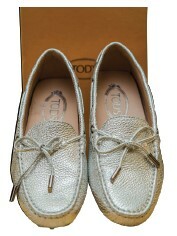 This pair of loafers from TOD’s was a gift from my brother on the occasion of Rakhi. Now, I practically live in them, be it summer or winter. They are not only stylish but also super comfortable. I love Blush by Marc Jacob. It has a very distinct smell; it is a little on the stronger side. What I really like about the perfume is that its scent can last an entire day. 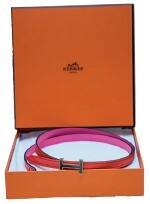 I was at Istanbul Airport, rushing to catch my flight when I came across this bright and vibrant belt at the display of Hermes. I immediately went in and purchased it, then rushed off to board the plane. My face is really small and long as well, so it is very difficult to find sunglasses that compliment my features. After months and months of searching, I found the perfect shades by Bulgari. I received a lot of compliments and these are perfect for my face. I am not too much of a make-up person, but I do have this bronzer/blush from Bobbi Brown, which really compliments my skin tone. 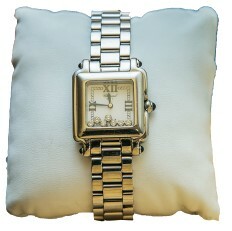 It’s super easy to apply and suitable to wear any time of the day to add a little glam. A watch from Chopard had been on my wish list for a long time, and on my 30th birthday, my mother-in-law surprised me with one. I was really overjoyed with her gift; it is one of my prized possessions. It has happy diamonds and it’s an accessory that can make any outfit stand out. I am not a gadget lover, but I swear by my S8. I don’t even need a laptop now. It has all the functions that I want and it is pretty good to look at! For a long time I really wanted a cocktail ring and my parents were aware of it. I had just given birth to my second child in Mumbai and was at the hospital. At that time my father went to the jeweler and gave him a big centerpiece and got this ring designed overnight. When I came home the next day, he surprised me with it and I was really happy. Thus, this ring has a lot of sentimental value. I love to travel and have been to many places around the globe. Two of my favorite destinations would be Spain and Greece. The sights around both these places amazed me. I generally don’t pay a second visit to the places I have traveled to, but I would definitely go back there!